Kenneth Manders (PhD, UC-Berkeley, 1978) is associate professor of philosophy, with a secondary appointment in history and philosophy of science, and fellow of the Center for Philosophy of Science. He currently serves as Director of Graduate Studies. He was a fellow of the Institute for Advanced Study in the Behavioral Sciences and NEH fellow, and has held a NATO postdoctoral fellowship in science (at Utrecht), a NSF mathematical sciences postdoctoral fellowship (at Yale), and a Howard Foundation Fellowship. His research interests lie in the philosophy, history, and foundations of mathematics; and in general questions on relations between intelligibility, content, and representational or conceptual casting. He is currently working on a book on geometrical representation, centering on Descartes. 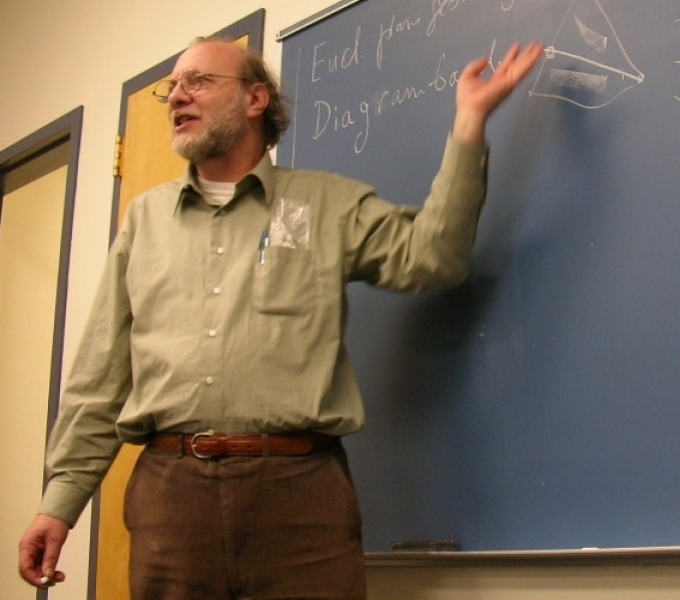 He has published a number of articles on philosophy of mathematics, history of mathematics, model theory, philosophy of science, measurement theory, and the theory of computational complexity. Manders, K. and L. Adleman. NP-complete decision problems for binary quadratics. Journal of Computer and System Sciences 16 (1978), pp. 168-84. Interpretations and the model theory of the classical geometries. In: G. Mueller and M. Richter, eds., Models and Sets. Springer Lecture Notes in Mathematics 1103 (1984), pp. 297-330. Domain extension and the philosophy of mathematics. Journal of Philosophy 86 (1989), pp. 553-62. Diagram-Based Geometric Practice. Chapter 3 in P. Mancosu, ed., The Philosophy of Mathematical Practice. Oxford Univ Pr, 2008, pp. 65–79. The Euclidean Diagram (1995). Chapter 4 in P. Mancosu, ed., The Philosophy of Mathematical Practice. Oxford Univ Pr, 2008, pp. 80–133.